There is a very sad song by William Fitzsimmons called, "Afterall." It's a song that pleads for love to remain, after all. With the memories of wedding vows in repetition, the song is so painful because by the end he is pleading without hope of securing the love, afterall. Tonight, for some reason I feel the sadness of the "afterall," but my heart pleas from a different place entirely. Fitzsimmons sings, "Please don't leave me..." and though I feel at home in this phrase it's not because I want someone to return to me, but I feel the song drifting from the lips of my glorious Savior. The sadness does not come from my hope in a relationship that will only disappoint. No, my sadness comes from disappointing the One who offers the only hope. Yesterday, Good/Black Friday passed without a solemn reflection or study, though I saw a bit of the processional in the city, noted the elaborate alfombras in the streets (beautiful, colored sawdust carpets), and searched for several inspiring articles and meditations (relevant, chris tomlinson's poem). I spent most of the day with a student and her family, reading, hammocking (my newest favorite thing to do), swimming, playing volleyball, eating, and passing Spanish conversation. So, after I got home and checked my twitter/email/facebook (in that order), I was just ready to be done. I didn't have any ambition to open my Bible or journal or pray. I was just tired. So, I slept like a rock and this morning came without announcing its arrival too loudly (or too early). And, about the day I went. Something I forgot to mention ... an extremely important *something* happened last night and again now as I am writing this. If you haven't been following Central America's news lately, the current drought is a pretty big deal. 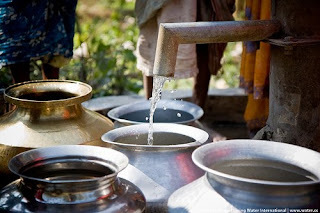 Some people in certain areas are only receiving water once a week and others less than that. Last night, when I was outside the city with my student's family, the drips started to softly pound the tiled roof. It had been so long since the steady sound and smell of rain had visited this place. When the electricity went off, I really started to breathe in the smell I love so much: wet ground. How strange, I thought, that on the night when Jesus was so cruelly crucified all those years ago... on this night the rain falls to water the earth. Only with this sorrow from heaven could there be any chance of life here on earth. In "Reason for God" Keller writes that Christ's forgiveness for us was costly suffering. This forgiveness of a world of sins stands very intentionally in front of the most costly suffering the same world of sins could muster and says, "I will take it all." The meditating I refused last night is now hitting me like the lines of Fitzsimmons' sad song of broken wedding vows. I am most humbled and hurt by my willingness to be so cavalier with my Savior, who has suffered at great cost to forgive me and pull me closer to His side. Though my Groom has laid out great, mysteriously beautiful instructions to know and love Him, I leave for other lovers. Like almost every other day this week, this morning I grabbed my stack of books and set off for morning coffee and a place to flip some pages. I met up with my friend Jess and we compared stories about Semana Santa and laughed about the silly things and frustrated ourselves over how our lives aren't exactly how we pictured them and how there are so many things we could change and how (especially) we would love it if God could very obviously point out the next steps in our journey. At one point in our conversation, Jess said, "Sometimes, after we talk I feel so... discontent." I think I said, "I KNOW!" before she even finished. It's still raining outside and I am so unbelievably glad. In Catholic tradition, the most ceremonious part of Easter is Friday when Jesus was crucified. They march through the streets, build beautiful shrines, act out portions of the event, and mourn the loss of the Messiah. And then it's over. It's still raining outside and I am so unbelievably glad, because the rain is LIFE and not death. Because though my Savior suffered at great cost for my penchant for other lovers, it is only through His suffering that I can live. Just as the death of drought finds life only by rain, so our heavy, other-lover souls find LIFE by Christ's costly tears of suffering. Last week I was asked to speak at a neighboring Christian school in Tegucigalpa at a few chapel services. Even though the target audience seemed a bit young (6-8 grades), I decided to just share what was on my heart: BEST. Here are some snippets. We (people) have this knack for settling for mud pies (as C.S. Lewis brilliantly explained) when we could be having a holiday at the sea. This is not a new revelation, but maybe I've recently found more clarity and urgency in its message. We are FAR TOO EASILY PLEASED, C.S. Lewis says. And so many years later, it is still true. We make ourselves content with things that are just "okay." We hope to have an okay job. We want an okay house and kids. We desperately hope for a just barely okay existence. Do you think God created us to just get by in this world? To skim the surface and all the okay pleasures and passing comforts of this place. It is SO MUCH LESS than abundant! Jesus promises in John 10:10 that he came to bring life and life ABUNDANT. So, to hear/see myself or anyone else giving in to the pressure to just barely squeak by is... is like watching someone (sitting cross-legged in a shallow puddle, splashing mud everywhere) refuse a ticket to the most beautiful destination known to man for an indefinite amount of time. I want to say, "WHAT ARE YOU THINKING!?!" Every single day, God holds out the BEST there is ... the abundant life He promises. Every day we look at the BEST and choose just okay and we fill our lives with mud pies. I'm holding out hope for the BEST. Praise the Lord, in His grace He continues to offer us life abundant through the rich knowledge and understanding hidden deep in His Word. we can take a huge lesson from our Savior... and learn also that BEST involves suffering. We are co-heirs with Christ, sharing in His suffering and future glory. whew! Check out this sweet article from The Gospel Coalition and then pray with me for Burma. What are we learning in Haiti? Be love now. Be love before, during, and after crisis... not just when the earth shifts. I finally got rid of my doubting spirit and have again a heart set course for joy. Praise God. I was in a funk and I'm so thankful those don't last forever! I have to share a wee-little story about my time in funk-city. I was riding the bus down last week, after staying after for Bible study. I sat in the front and let worship songs be an escape for awhile until a student came and sat next to me. She had questions about this and that and finally she asked (could it have been because I was obviously weeping?) me, "what's up?" I just said I was sad. I was sad about how deceptive life can be and how glittery the world looks and how so many people I love make the wrong choices. I was sad because I couldn't stop it, but also sad because I knew I wasn't doing enough. I was just sad. Then (as if revelations such as these come so quickly and gently) she said, "Well, I bet that's how God feels when He looks down at us... only magnified." .........whoooosh. This is the perspective I needed! Free music by Shaun Groves. I really support the way that this man is going about his ministry through music. Check him out - he'll give you three songs for free here. You probably know I just finished Forgotten God by Francis Chan. Well, I didn't use any of his internet resources for this book (even though I really liked using them when our Bible study read through Crazy Love). But, now I find out that there are some great resources there! Also, I happened upon this "trailer" on vimeo and I think it's worth checking out. It just might convince you that you should pick up the book too. Let's just say you are like my dad and in the car a lot. And let's also say you wouldn't mind having something intelligent to listen to (other than, let's say, radio talk and country music), then you should definitely check this out: Christian audio allows you to download one FREE book each MONTH! That's right - it's free! I'm all about getting things for freesies and this month I think it's a gem, so I'm sharing it with you. It's a book by Mark Driscoll called, "Religion Saves." Thanks, Christina for writing yesterday about business vs. personal. I think the blurred line only gets more blurry when you are working in a Christian context. Because your business is also mission, and also community, and also the Body of Christ, and also family. All those things together make for a pretty crazy mix of business/personal. I have to echo the thoughts of our mom on this one... personal goes with you wherever you are. You bring 'personal' to every meeting, every encounter with a student, every board decision, and every pink slip. You bring personal because that is how we are made: personal, relational, human. I think God intended it this way. But, it sure is difficult. So, you may be trying to connect the dots and having trouble. "Joy, suffering, Nehemiah 8, and now this strange writing about Truth and destruction? You totally confused those kids, Caroline!" Well, I didn't share my personal writing in my message, but what I DID share was the beautiful realization that God offers His very presence to the people of Israel who had listened to Truth for seven hours and felt the meaning and their sin rip open their souls. They were destroyed by the gap Truth exposed between them and a precious, perfect God. At that moment, God reached out to their broken, bruised, battered hearts and said, "Do not grieve." He saw that they realized the depth of their brokenness and at that moment He invited them into JOY. He invited them into His presence to sit beside redemption and drink in life. I guess I'm on a bit of a poetry kick these days and I don't mind at all. I hope you don't either. I finished reading "The Singer" by Calvin Miller at the same time that the song, "Come and Sing" by Brooks Ritter (see yesterday) was repeating on my ipod. To put it shortly: after (what could have been merely) a frustrating day, I realized something... If all I accomplished today was getting myself to that beautiful throne to join in the angels' song, then that would be just fine. If I made it there and just really belted out my heart full of gratitude, then this day was alive. This song just kind of bubbled out of that joy. God is living in me. I just want to post a few reflections I had on the Holy Spirit while reading through Forgotten God and studying Scripture. I am overwhelmed at this idea that God is inside of me. The power of the most High, the beauty and perfection and love and GOD. Inside of me, really? I can't make sense of it. Inside me is so close. I can't escape this body and that's how close He is. The Holy Spirit is in me. whoa. littering the corners and walls and storage bins of my heart. You are closer than the words on my lips. You are right here ... burning up like heartburn my inside. for I did not realize how close you were. Compassion International is an organization that has proven themselves faithful to God's call to serve the poorest of the poor throughout the world. When a crisis happens, I know Compassion is already on the ground and already working with churches in the country that they have developed relationships with. I know when I support Compassion, I am not just giving money to a haphazard medical mission, but a structured organization with a pure heart fueled by God's design. The Gospel Coalition Blog has posted some really great, honest articles that give some perspective. 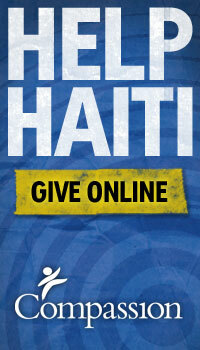 I especially liked the article, "Live with Haiti in Your Heart." If you feel yourself stuck in a strange place of apathy and guilt, read this article. This song is an anthem and a challenge to the church to rise up in the midst of hurting and pain to heal the world with the power of the Lord. Click on the link below to download it.. hopefully it works, it's a link from twitter. If not, go to NationsBeGlad twitter and they posted it there. I spoke tonight about joy and suffering at the HS outreach. This is the passage (thanks to my mom) we focused on and I believe it is so powerful in our understanding of what joy is, how we can find it, and how much God desires we have it. 7 The Levites—Jeshua, Bani, Sherebiah, Jamin, Akkub, Shabbethai, Hodiah, Maaseiah, Kelita, Azariah, Jozabad, Hanan and Pelaiah—instructed the people in the Law while the people were standing there. 8 They read from the Book of the Law of God, making it clear [a] and giving the meaning so that the people could understand what was being read. 9 Then Nehemiah the governor, Ezra the priest and scribe, and the Levites who were instructing the people said to them all, "This day is sacred to the LORD your God. Do not mourn or weep." For all the people had been weeping as they listened to the words of the Law. 11 The Levites calmed all the people, saying, "Be still, for this is a sacred day. Do not grieve." Read through this a couple times and see if your view of joy doesn't change too. Happy weekend everyone!